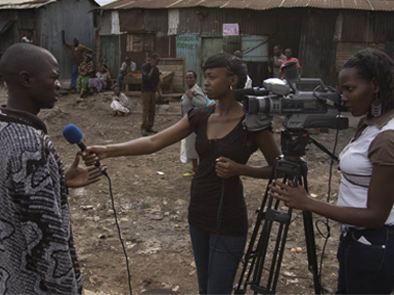 A Community Media House is an organization, deeply rooted in the African slum, that recruits and trains young people in film making and editing. These reporters bring out real life stories, stories that are not always brought to you by established international media houses. This project is an initiative of the Voices of Africa Media Foundation located in Haarlem, The Netherlands. They stimulate and facilitate community based reporting, as they believe this will bring out the voice of Africans to a wider audience and contributes to transparency of local issues. Every two weeks a new video-episode of daily life slum news is published through the online TV-channel The African Slum Journal. The subscription revenues of The African Slum Journal are an important source of income and are used to finance the start of Community Media Houses in more African countries. The first Nairobi Community Media House in Kenya is operational. Reporters own 50% of a Community Media House. The other 50% is owned by the Voices of Africa Media Foundation. It’s a great initiative to contribute to the world in a sustainable way.